Students are not angry enough about precarious work. The general consensus says it’s awful but too many students are too accepting of it as an unpleasant but unavoidable reality. Worse, some keeners even embrace non-standard work as freeing them from the trappings of the 40-hour-a-week slog. The low pay that comes with it is further accepted as the value of less serious work. It’s a curious irony that as students look everywhere for (usually justified) outrage, the appalling standard of living most of us will be trapped in elicits so little. The statistics do not need to be repeated, but they will be. A study by Meal Exchange last year found a mix of high student fees and debt, along with low pay, left nearly 40 per cent of Canadian students food insecure. No, things most likely will not get better for graduates just because they have degrees. The same Meal Exchange study noted 70 per cent of jobs require some post-secondary education. Yet, United Way found 52 per cent of those jobs in Hamilton and the GTA are precarious — marked by part-time contracts, generally low pay and no rights. Precarity is not new and it’s not an accident. It follows decades of attacks on labour and a general decline in the efficacy of capitalism. When previous generations were confronted with these sorts of attacks, they fought back. We got student strikes, wildcat strikes, general strikes, the Russian Revolution, May 1968 and the like. Few ended well, but they sure scared the wealthy. Life got better for the rest of us as a result. Torches and pitchforks do a good job of convincing people to share. Do not get upset about your low-pay, highly indebted and insecure existence. Get angry. Take the fight into your workplace and into the streets. Help your coworkers take control of the workplace you keep running. Fight to transform society to serve students and poor workers. There’s some history of this transformational activism at Ryerson. 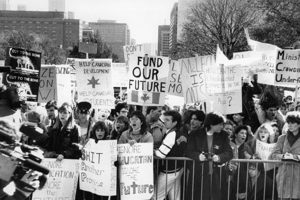 In Serving Society’s Needs: A History of Ryerson Polytechnic University, Prof. Ronald Stagg wrote, in 1966, the incoming president “had to deal not only with an institution in transition but also with the height of student and faculty radicalism. Taking back our workplaces and taking back society may be significantly more difficult than taking more power on campus, but the stakes are also higher and there’s more reason to be angry. Get out and fight back.